Meet Emin Agalarov, Trump-Connected Russian Pop Star Get caught up on the singer and real-estate mogul in the news for helping arrange a meeting between Donald Trump Jr. and a Russian lawyer. From left to right: Emin Agalarov, Donald Trump and Aras Agalarov (Emin's father) on the red carpet at the Miss Universe Pageant Competition 2013 in Moscow, Russia. Over the past few days, an old, hitherto unknown music video has gone viral: the music video for "In Another Life," by Russian pop star Emin. In the video, the singer frolics in a mansion with contestants from the 2013 Miss Universe pageant — the beauty contest then owned by Donald Trump. At the end of the video, Emin (full name: Emin Agalarov) wakes up from his fantasy. The video cuts to Trump at the head of a conference table, delivering lines straight from The Apprentice: "Emin, let's get with it. You're always late. You're just another pretty face. ... You're fired." Ever since Agalarov was revealed as one of the people who arranged Donald Trump Jr.'s 2016 meeting with a Russian lawyer who promised damaging information about rival candidate Hillary Clinton, this video and the rest of his online trail have been fodder for people curious to know more. 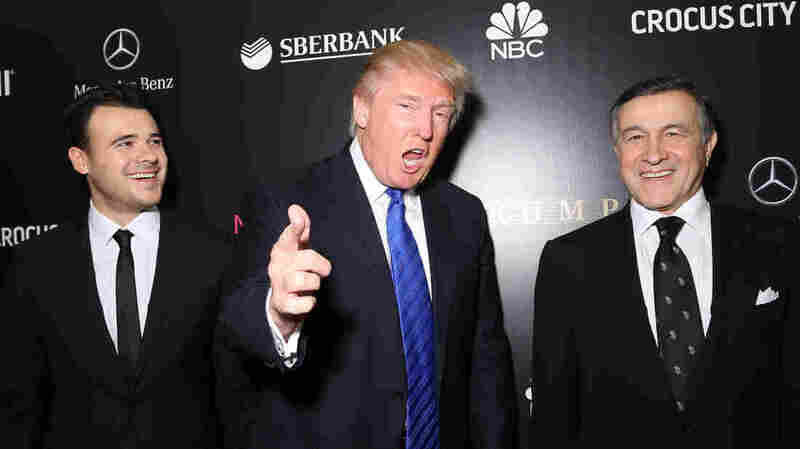 That trail is littered with plenty of photos of Agalarov with Trump over the years, as well as a videotaped birthday message Trump sent Agalarov in 2015. "You're a winner, you're a champ, you're great at real estate, and boy, can you entertain," Trump enthused. And after Trump won the presidency, Agalarov returned the compliment with his own video: "You're an absolute winner. You proved everybody wrong. It's incredible, congratulations." A few months ago, Agalarov boasted to Forbes of his continued access to the Trump family. And Agalarov's connections don't stop there: His billionaire father, Aras Agalarov, is close to Vladimir Putin, and his ex-wife is the daughter of the president of Azerbaijan, where Agalarov was born. Agalarov grew up in Moscow and went to college in New York. He's now executive vice president of his family's real estate company, the Crocus Group. And when he's not developing Russian shopping centers, resorts and boutiques, he's recording and performing around the world. Emin has covered Frank Sinatra and Elvis Presley in the past, and his latest single is "Good Love," from a new album coming out this year. But LA Times pop critic Mikael Wood, for one, is hardly impressed. "This guy's music is about as bland as it could be," Wood says. "He's like a bad George Michael or a bad Michael Bublé or he's a bad Ricky Martin, depending on the song." At some point in his music career, Agalarov — apparently a Russian sensation — became the client of Rob Goldstone, a British-born music publicist. The Russian government had reached out to Agalarov's father, after which Agalarov asked Goldstone to connect Trump Jr. with the Russian lawyer who promised damaging information about Clinton. None of these players was available for comment. Just weeks ago, Agalarov ended his U.S. tour with a concert at Lincoln Center, where he was joined onstage by musicians David Foster and Nile Rodgers. Now, he's center stage with Donald Trump — and everyone knows his name.